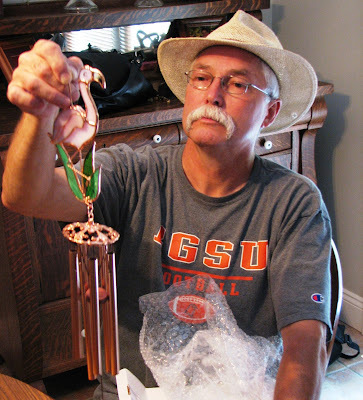 With plenty of rest and slow-going during the week, Ken was recuperated and ready for a weekend on the road. I had to be in to work by 6am Friday for a German payroll demonstration, so I started my ½ day vacation at 11:00 am. Ken picked me up in the Gardner Denver parking lot all ready to head out to New Berlin, IL for the Illinois Coachmen RV Rally. Ken drove while I changed clothes and made sandwiches for lunch. I drove for about 20 miles, trying to get use to it a little bit at a time. This is the first time I drove with the jeep behind. Ken’s brother Michael and his wife Jean were also on the road to the rally about 5 miles ahead of us. 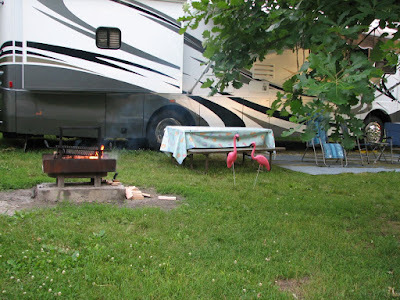 The last half of the trip, I fired up the laptop, checked in with some folks at work and then dropped by the Rv-dreams chatroom (I was amazed to find about eight people online mid-day. I was able to talk to another motorhome owner in the chatroom who is using an aircard for internet access and got some really good information. Having internet access is important to me, particularly as long as I’m working. It used to be that there was a dead spot with my Sprint broadband wireless aircard between Barry and Pittsfield but now there does not appear to be any dead spots between Quincy and Springfield. There are still deadspots on the way to St. Louis and Mark Twain Lake. Siloam Springs State Park is a total dead zone. After what I heard from the fellow RVer and the reading I’ve done, we are considering investing in a Smoothtalker antennae system to boost cellular signal. It purportedly increases your ability to reach cellular towers by 50 miles and improves quality of signal closer in. I’d need one of the newer air cards with the place for antennae input but I think the new one’s GD is getting now have that. The Smoothtalker equipment for the RV would set me back about $350 but over the long run it would be good to know we were accessible in all but the very most remote areas. It is also a great deal cheaper than satellite systems like Datastream which appears to be the next option up to insure more consistent access. Satellite systems run into several thousands of dollars for set up. I also prefer the air card over the satellite options or dependence on Wifi since I like to be able to use my laptop while we are on the move. 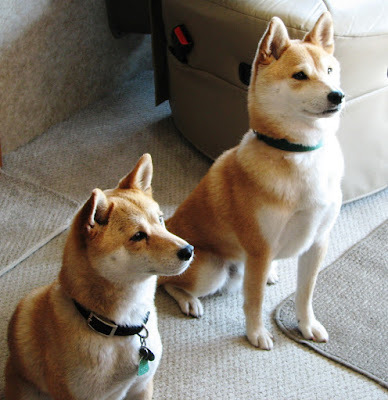 Then, if we connect the booster to a wireless router, like the Linksys router we already have at home, I can be running a WIFI connection off of my aircard and sit anywhere within 200 ft of the motorhome and use my laptop without need to being direct attached to the booster. Although we didn’t use it for this trip, Ken has installed our latest toy or should I say toy hauler for our adventures, a bike rack.. 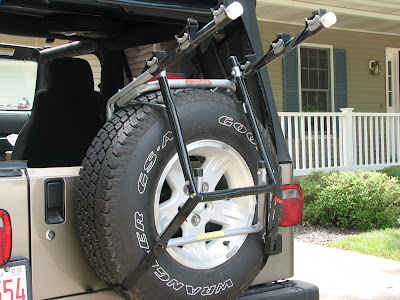 It is made for any vehicle with a spare tire but really perfect for use on the jeep spare tire. Ken ‘modified’ the instructions for attachment so that it hooks in to the inside of the back door vent versus on to the bumper. 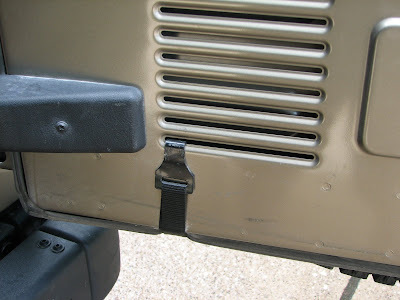 This allows us to leave the rack on permanently without losing the ease of getting things in and out of the side-open back gate on the jeep. …But enough about gadgets, and toys, back to this week’s adventure…. 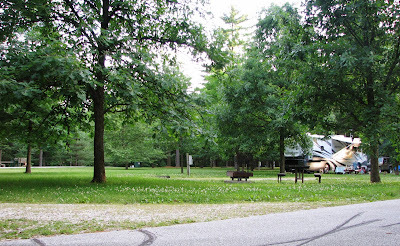 It was an easy set up at the Sangamon County Campgrounds. Ken took the extra time to set up his flamingos. Lo and behold, they seem to be multiplying! And now, they also seem to have found their own sunflower birdbath. Amazing how these things just keep popping out of our basement compartments when I least expect it. Michael and Jean were set up right across the road from us. We were soon on the way with drinks and chairs to join the group for socializing. I quickly found the Missouri group we’d met a few weeks back at their state rally. Some of these folks are just traveling from Midwest rally to rally. This is a real fun-loving crew. Frank, to the far right here had the best T-shirt we saw this weekend, it said 'I have gas and I know how to use it!' Ruthie, whom I'm talking to here, loves to heckle Ken when he's playing the games. They had some games scheduled but everyone preferred not to ruin a good thing and sat around the circle well into the evening sharing stories and enjoying each other’s company. Some of these folks have been in the club together for 30 or more years. Jean and Michael Frericks haven’t missed an Illinois rally in 34 years! At least one of the ladies had set out so long in the circle that by nightfall, she had some pretty fiery-looking skin. 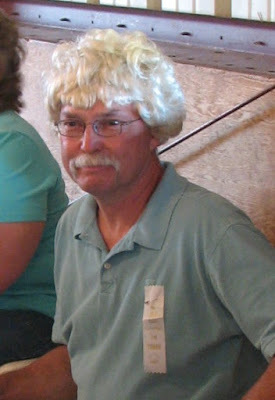 Frank (new buddy from Missouri chapter), offered to rub her down with lotion but another lady said she had some vinegar she’d get from the rig that would do the trick. We gave Frank quite the hard time being second choice to a bottle of vinegar! On Saturday, we had some games. Ken got third place in the bean bag toss. The newly elected Illinois president, Loren, is checking Ken’s brother, Michael’s scores here. He knows who to keep an eye on! 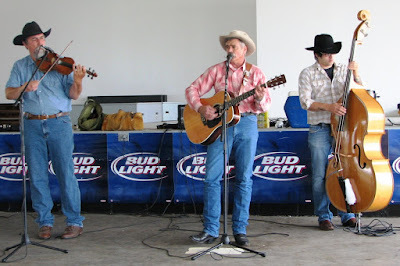 …followed by entertainment by the ‘Jolly Cowboys’ who not only played but did some really hilarious ‘cowboy poetry’. We played euchre fellow rally first-timers, Tony and Bernie Smith from Arlington Heights,IL. 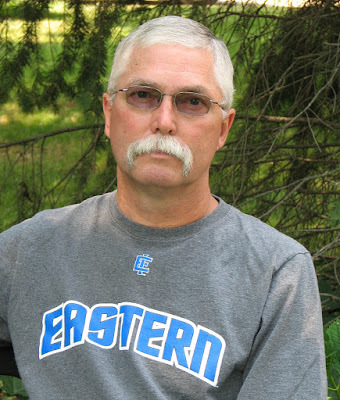 He is Ken’s age and was in the seminary in Quincy in the early 70’s, graduating from Quincy College, so it was interesting to find how many common acquaintances we shared. Tony is retired from Chicago Transit Authority but takes on jobs frequently delivering RV’s across the country. It was good to hear him say he would want a diesel pusher for fulltiming since he has driven a huge number of miles in a wide variety of RV’s. We ended up sitting around with Bob Byrnes, Tony and Bernie sharing stories of great sites across the US to visit, everyone agreeing that its most fun to hit the back roads and all the surprises they can unfold. 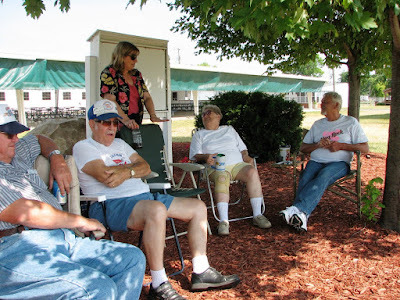 This is what we love so much about these rallies, not just the new friendships, but learning from the experienced RVers, where to go, what to see, how to get there. 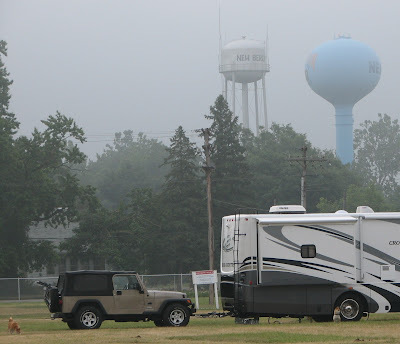 Sunday morning was misty and quiet in the campground. I took the dogs for a long walk. At 8am ,we met the group for continental breakfast and then took our time packing up and doing more visiting. We decided to take advantage of our proximity to Springfield and hitched a ride with Michael and Jean to Olive Garden for lunch. (We ended up not unhooking the jeep all weekend!) Once back at the fairgrounds, Michael and Jean, being the free retirees that they are, decided that they were going to stay in the area for a few more days, heading over to New Salem for a few more nights camping. Ok, that’s why I’m counting the months until I can retire—how cool to decide at a whim just not to come home!! We did a new record for us, 5 minute stop at the dump station, and headed out. Of course, Ken loved the opportunity to honk good-byes to big brother with his big air horn as we go out separate ways on the interstate. Now that Ken has figured out the Freightliner computer system and economy mode, he was able to monitor more exactly the mpg on the drive home. We are now getting 10.6 mpg pulling the jeep as the computer readout above showed us. 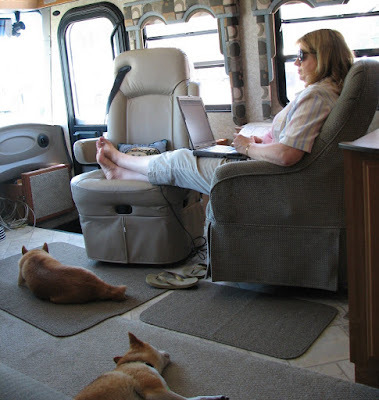 Ken listened to the Cubs vs. Sox on the radio while I worked on this blog and did a little more ‘chatting’ on RV-dreams It’s amazing how the time flies when traveling and blogging/chatting at the same time! We were home by 4pm and ready to get back to stick-house life for another week. Father's Day Weekend not so fun for Father! We decided since Trev came home for Father's Day, we'd just stay around town for the weekend and work on the RV. Ken and Trev picked up the RV on Friday and parked it in front of the house so we could give it a thorough cleaning. When I arrived home from work the guys were hard at it so we finished off the exterior before dinner...thank goodness. As it turns out, it was very lucky that we decided not to go anywhere this weekend. Friday night Ken came down sick and before long it was obvious he was not just sick but experiencing a full-fledged blockage from his Crohn's disease. For him that means that the place they've done five surgeries over the years, in his small intestine, totally closes. When that happens it first causes nausea, then severe pain, then everything comes back up. At that point anything, even a glass of water comes right back up. In the meantime the bile in his system seems to goes into overdrive and makes him even sicker and weaker since it has no place to go. It's been awhile since he's been this bad so it caught both of us by surprise. At least it was obvious early on what he was dealing with so Ken immediately pulled out some Prednisone, a strong steroid, and downed them. He tries to stay away from these drugs, since they really mess with his head but he's found when things get this bad its the only drug that can get him any kind of temporary relief. Unfortunately, for Ken as Dr. Bozdech calls it, it is the 'mean and nasty' drug. Apparently it affects some people like it does Ken and their personality can take sudden swings to really uncharacteristic ugly moods and tempers. Ken knows this and so is trying to take only enough to reduce the inflammation causing the blockage and no more. At about midnight, I was pretty certain we were headed to the emergency room but finally the drugs seemed to get hold on the inflammation and his pain started to ease up. He wasn't up to heading upstairs to the bedroom so the dogs and I slept on the floor in the family room to keep an eye on him. Luckily by about 5am he seemed to be able to sleep some and by mid-morning he was up and around a bit. I went out to the RV to wash the windows inside and out. Ken followed to keep me company and since he really wasn't up for moving about much, sat in driver's seat trying to figure out the crazy Freightliner computer monitor that seems to have gotten the better of him. Needless to say we took it very easy the rest of the day since Ken was very weak and afraid to eat or drink anything. We watched an old Zorro movie. I went and had my nails done while Ken napped. By evening Ken was ready to do some mashed potatoes and later some ice cream and by Sunday morning seemed to be looking almost back to normal despite being weak. Like the doctor in St. Louis told him once, "Man, you look in better condition in person than in your X-rays!" I even got him to pose for this Father's Day portrait! We didn't get to do a full Dad and Lad photo since Lad Kyle didn't make it home but Trev did his best to take up enough of the bench for both of them. Trev also tried to get a Father's Day picture of Dad with Mom and the pups but nobody seemed very interested in sitting still for that! 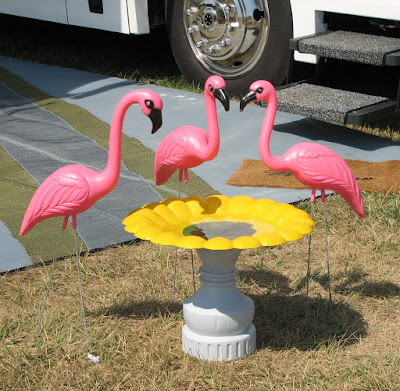 Ken opened his Father's Day gift, a flamingo windchime to keep his two lovely plastic pink flamingos company outside the RV. So the weekend is over. The motorhome is parked away again all clean and shiny. Ken seems to have come through his blockage bout and all is well that ends well! This was the weekend for us to attend our first Coachmen Caravan rally. The Coachmen Caravan Club is over 40 years old, and is exclusively for Coachmen owners. 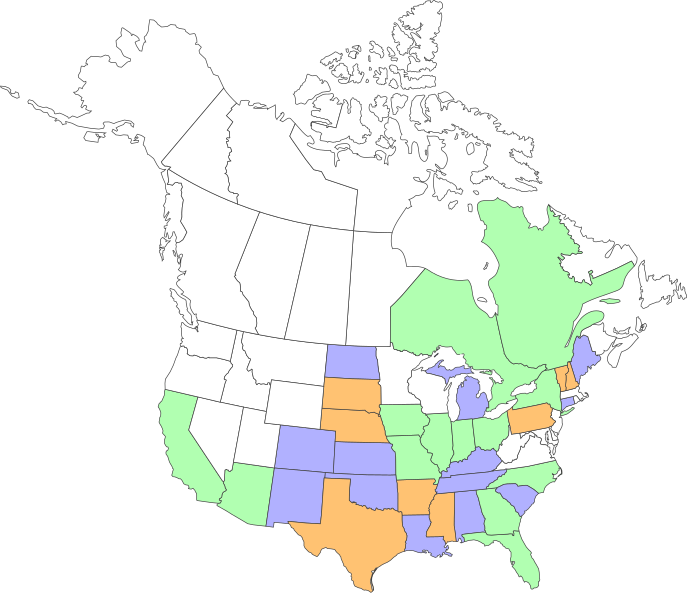 It has over 15,000 families as members throughout the United States and Canada, and is the nation's largest manufacturer-sponsored RV club. 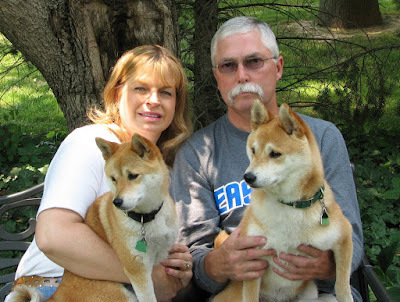 Ken’s brother Michael and sister-in-law Jean have been members for literally decades now. We consider these events a great way to get to know other people who have more experience with motorcoaches just like ours. Howard’s RV, where we bought our motorhome, is a club sponsor and paid our first year’s membership to the club. We heard the Missouri rally was one of the better state rallies and decided to make it our maiden voyage to a rally. Since Kyle had come back to Quincy for the weekend, we didn’t head out until after a late breakfast on Friday. It was a bit windy so Ken decided to take two-lane US 24 across Missouri instead of I-70 since he hates the traffic and speed on I-70. This was the chance to cover some unfamiliar Missouri back roads, passing pecan and buffalo farms and several wineries along the way. Highway 24 also follows a portion of the Lewis and Clark trail which adds a historical perspective. We took our time and stopped in Brunswick, Mo, for a late lunch. There was a huge gravel parking area across from a non-chain restaurant with lots of cars in its parking lot. That adds up to the kind of place we like to stop midway in our trips! 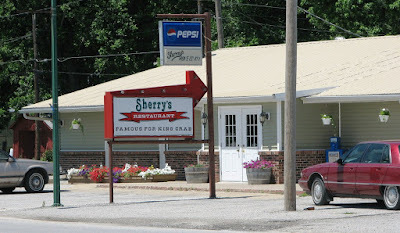 Sherry’s Home Cookin’ was a nothing-fancy smalltown café with a catfish lunch buffet that was perfect for Ken. I had dessert for lunch with the homemade blackberry cobbler with ice cream. We arrived at the rally at the Higginsville Fairgrounds at about 3pm and parked by three other Sportscoach diesel pushers. 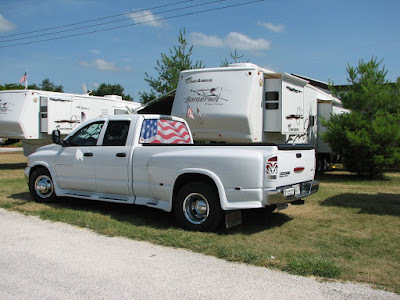 We didn’t get an exact count but there were somewhere around 50 rigs at this rally, ranging from Coachmen popup campers to diesel pushers our size. Some of these people have been together in these clubs for upwards of 30 years. 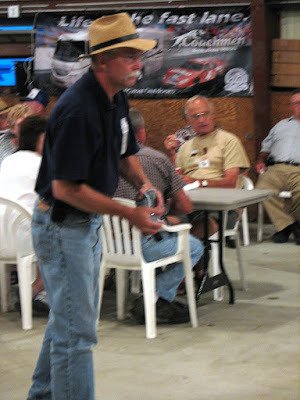 Eric, our salesman from Howard’s RV, was there with his girlfriend,.Kim. Howard’s had brought six new rigs to display at the rally to tempt everyone, and Eric was there to help provide the tours and do the tempting. Sox made quick friends with Kim. There was a light dinner of sloppy joes for Friday dinner. It’s apparent why they choose fairgounds for these rallies since the 4H building here made a perfect gathering place for this size group. 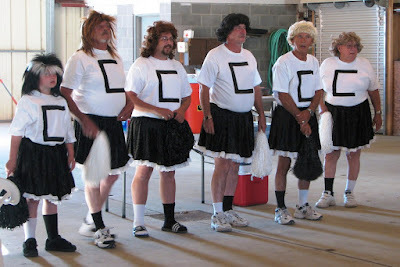 Tailgating has nothing on Coachmen rallies as we were welcomed by our very own Coachmen cheerleading squad. 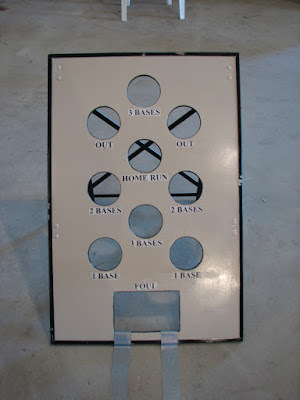 We played our first round of bean bag baseball tournament on Friday evening. This was a lot of fun so I got a shot of the board – looks like a good next project for Ken! It ended up that Ken’s team and my team advanced out of Friday night’s final to play against each other for the championship Saturday afternoon. 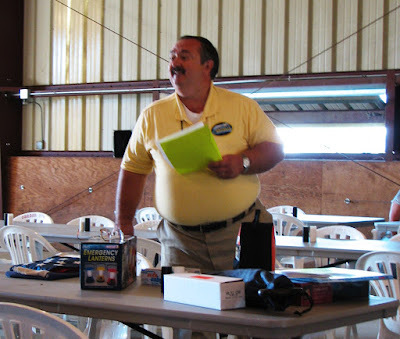 All weekend, the Missouri Coachmen Caravan president, Bob Byrnes, was giving out door prizes. Different Missouri chapters had different drawings as well. We were lucky enough to win a big box of groceries. One of the members has a 13-year old daughter, Mary, with birth defects who is a March of Dimes ambassador. In total, over the weekend, the various raffles and activities brought in over $500 raised for March of Dime in Mary’s honor. 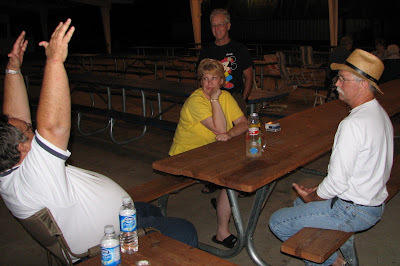 At about 9pm Friday evening, the group was treated to root beer floats. 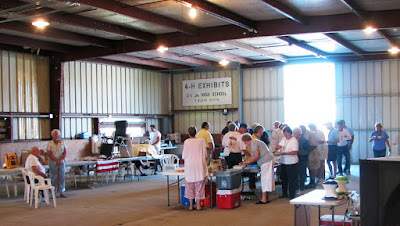 We enjoyed the snack, a little more socializing, walked the dogs and then were in bed by about 11:00. The ladies served us in their PJ’s! After breakfast, once again, the games began. There was crazy golf, and washers. 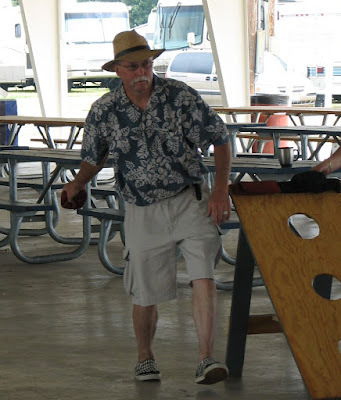 Eric won at washers…makes you wonder what they do when they are waiting for customers around the RV lot! 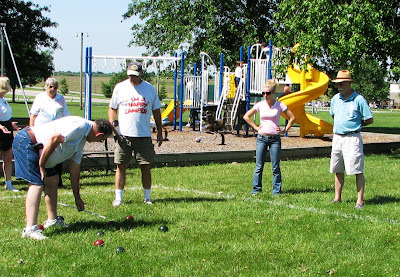 Here’s Ken and Kim in a tight game of bocce ball. Last year during the rally, they had a disaster. While everyone was at dinner one of the fifth wheels caught fire. It was a total loss and melted the sides of the two rigs aside it to the point they were both totaled as well. Actually it could have been much worse but the Higginsville volunteer fireman and many of the fellow RVer’s kept the fire from spreading further. The Higginsville firefighters also found the couples from all 3 units homes to stay in for the night. Thanks, Bill Petty, for sending me some pictures to include. Words couldn’t describe something like this! One good side to this bad event was that the Caravaners got to know the local fire and rescue squad who happened to this weekend be having a big benefit barbecue at the Piggly Wiggly. 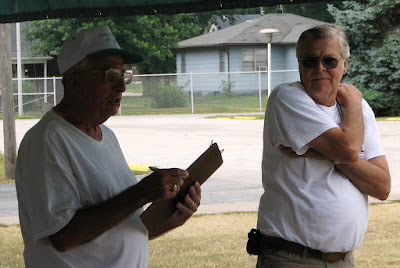 This was a perfect break for lunch so we and many of the other RVers walked to the Piggly Wiggly where Eric got this shot of Ken and I. There’s just something really Heartland Americana about walking down Main Street to eat at the volunteer fire department benefit in Higginsville! Since the benefit menu was strictly hot dogs and hamburgers, we also picked up a slab of bbq’d ribs from the Piggly Wiggly since Ken didn’t expect to make it from noon to 6:00 on a hot dog. We had a little time before the ‘baseball playoff’ in the afternoon so Ken and the dogs kicked back for awhile while I checked emails and finished a little work. It was then off for the beanbag baseball championship, Ken’s team against mine. 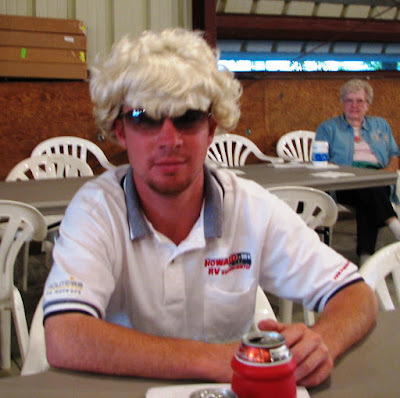 Since Ken was the only man on his team, he decided to look the part of the sister’s! Actually I think he looked more like Mark Twain! Our parking spots were, next door to a park area that includes several fully enclosed baseball fields. After Ken’s team managed a victory over mine, we decided to give the dogs a treat by taking them inside one of the fenced fields and letting them run lose for awhile. 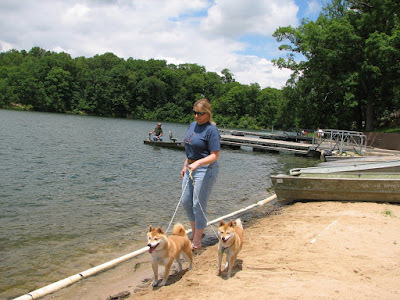 They are rarely outside without leashes so they had lots of fun romping in the open spaces. We got back to the rig around 4:00 to take a nap before dinner. We made a snacktime dent in the rack of ribs. I kicked back on the bed with the book I’m reading and must have fallen asleep immediately. Ken woke me at 5:50. He said he and Ditka had gotten sidetracked talking to some people and never made it back into the coach. Strange…then why were the rest of the ribs gone that I’d left out for him. He assumed I’d eaten them. No. Hmmm…We looked around. No ribs, No ribs container. 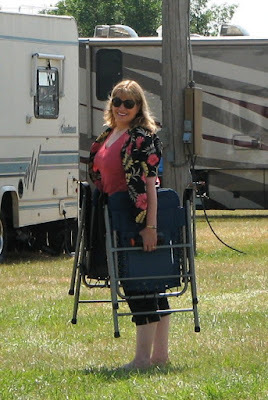 Just as we were headed out for dinner, Ken spied the ribs container under the easy chair. No sign of the meat, the sauce, the bones. One of these two lovelies had to be the ribs thief! Since the biggun’ was with Papa the whole time, that meant precious little Soxie was about to have one heck of a tummy ache! We had a huge dinner of chicken, dressing, potatoes, gravy, green bean casserole and homemade rolls with apple butter. 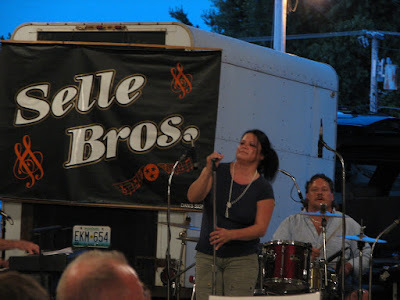 The entertainment for the evening was a very talented country Western band by the name of the Selles Bros. They had a Jerry Lee Lewis style pianist and a female vocalist who ended the evening with a rendition of Amazing Grace that earned her a standing ovation. There was dancing, more door prizes and ice cream and cake. I think everyone had a really enjoyable evening. We thought we were going back to the rig at 11:00 to hit the sack, but instead when walking the dogs came across a big circle of folks who invited us to join them. They were telling stories that had Ken holding his chest and out of breath from laughing so hard! It was after 1am before we got to bed! The dogs woke us at 6am announcing their concern about a thunderstorm rolling in. It was good that they woke us since we still had our awning out. The storm turned out to be uneventful, going mostly to our north. After a continental breakfast with the group, good-byes, and a stop by the dump station we were on the road by about 10:30. The pastries weren’t an adequate breakfast for Ken, so we decided to make another visit to Sherry’s Country Cookin’. This was obviously the place to be for Sunday lunch as we had to wait for them to clear a table for us. If you’re looking for immaculate floors, and appealing décor, this isn’t your place, but if a buffet of homemade Sunday dinner items that rival any we’ve had, this is a stop worth planning. The bbq ribs melted in your mouth and Ken said he can’t remember when he’s had better fried chicken. 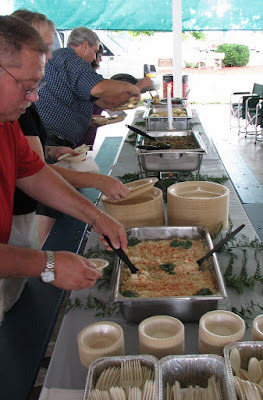 They had lasagna, homemade chicken and dumplings, and a really awesome apple bread pudding. All of that and iced tea for $20 for the two of us. It was at this point that the drive home took a temporary turn for the worse. Trevor called to tell us that according to the team trainer he has a stress fracture in his foot and will not be able to practice on it for 3 weeks. He was really disappointed as he feels this will set him back. He goes to a specialist Monday so that doc can be sure that this mode of treatment is adequate. I really think sometimes it was easier when the boys were younger and underfoot all the time! We’d no more than finished talking to Trevor than I noticed a real stink in the coach. Looked out the windows…no hog or cattle around…hmmm. Ok, Ken, did you just….. His response was, ‘No, did you?’…hmmm…sure hope there’s nothing wrong with the black water tank. I got up and headed to the back and found the culprit immediately…it was Sox. Apparenly the bbq ribs had taken their toll. Thank goodness she was in her ‘puppy tent’ …but that crate was covered. Of course, Sox is so prissy that she’s going nuts trying to keep from getting anything on herself. Luckily we were just entering Moberly and found a closed-down WalMart where we pulled over and pulled Sox and her mess out of the motorhome. . Sox had done a good job of keeping herself totally clean but was one sick puppy. I spent a lot of time with her in a grassy area nearby. Thank goodness the puppy tents fold up so Ken could just stuff her crate, blanket and all into a big garbage bag, then into one of the outside compartments. It ended up that Ditka got the best part of the deal since we then put Sox into his crate and left him out on a leash up by us. The rest of the drive home, it was obvious little Sox couldn’t get comfortable. When we got home she just laid in the backyard hardly moving for hours. Well it was a really great weekend even if it wasn’t the best drive home. On Monday, word from Trevor was that the doctor has now decided he needs an MRI on his ankle. The news with Sox was much better---she’s fully recovered, showing no more effects from her run-in with the bbq ribs. 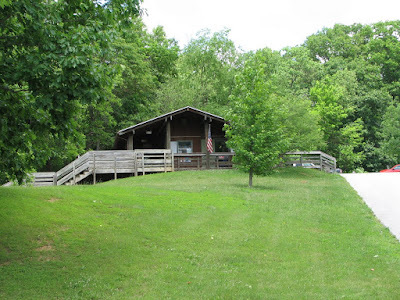 Ken decided to go out to Siloam Springs State Park on Thursday to insure that we had a good weekend site. Well wouldn’t you know it.. Even going as early as Wednesday last time to Indian Creek did not get us a full hookup site. But amazingly, at Siloam this weekend it was almost deserted. They don’t have any full hookup sites but Ken did get one on the few 50 amp sites. I drove out after work on Friday. Ken had the fire going and had out two new purchases he’d made. He went out to the fabric store and bought an extra long length of oil cloth since most of the tablecloths are not long enough for the park picnic tables. He got the bright colors to match my retro 50’s dinnerware and then decided to complete the look with pink flamingos! 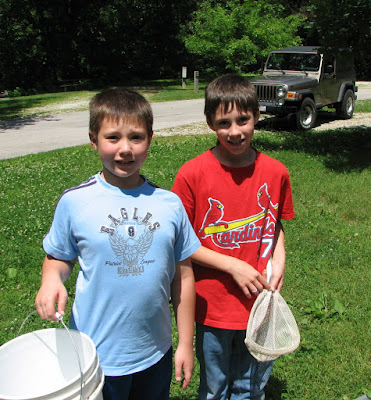 sprays containing permethrin. You spray it on clothes instead of yourself. In the picture above I have the clothes I planned to wear on Saturday setting out after being sprayed. I did my cap and socks as well so we’ll see if this keeps them away and better. Since every tick I’ve found attached to Ken or me has been inside clothing, this might be the trick and certainly preferable to having deet sprayed all over our skin all the time. You can get this stuff at WalMart so it’s not hard to find. Apparently the stuff works even after multiple machine washings so I’m optimistic! One thing I really like about Ken’s choice of campsite, is that he chose one where we don’t have so many trees overhead. We seemed to have ticks falling from the trees at our sites in the past so that is one more precaution we’re looking at now when there’s a site that looks comfortable without having full cover of trees over head. Ken had spent the day working on odds-and-ends around the motorhome including rigging up out outdoor string lights to go easily on and off the awning with their plastic strips in tact and still be in the perfect configuration to lay in flat loops in the compartment we’ve set aside for our patio accessories. 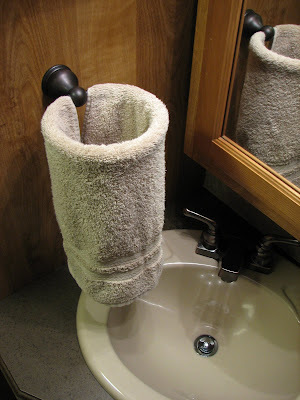 I have to say, finding the bathroom handtowels displayed in this way made me wonder if I hadn’t left him alone for a bit too long! But, besides his decorative hand-towel art, he did find time to make a great batch of beef stew from scratch. 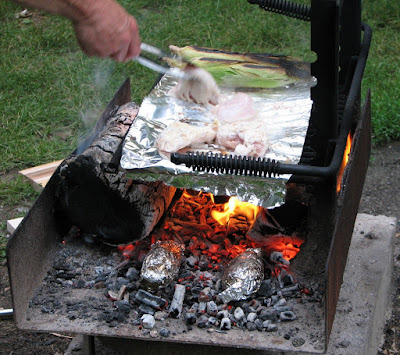 He roasted a couple of ears of sweet corn over the campfire and I got to be the princess walking in from work to a fully cooked, wonderful meal. 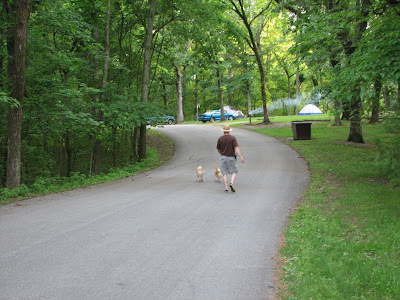 After dinner we took the dogs for a walk to some of the other camping areas. We saw several deer along the way. We saw the evening to an end, having a few drinks by the fire. We’ve proven that we are totally without connection to the outside world with neither our cell phones or my laptop making connections from here. Text messages on the cells come through but that’s it. That means I have to relax since I really don’t have much of anything I can do for work without a connection! About 4am Saturday morning we were awakened by a thunderstorm. We had taken the chance of leaving the awning up. Ken decided to go out and pull it in with the rope lights attached, better to save the awning and risk breaking the lights. Amazingly, come morning, the lights were fine, although, with the forecast for continued rain and storms, we decided to put the lights away. I like to have the awning out and sit outside when it rains but we didn’t want to tempt fate twice and have to make a quick close of it with the lights attached. Saturday morning was wonderful because we did absolutely nothing. It was the first time I got to use the new Mr. Coffee we bought last week. We knew we didn’t want a glass carafe for clanging around and breaking in the coach and we ended up finding one even better than expected. 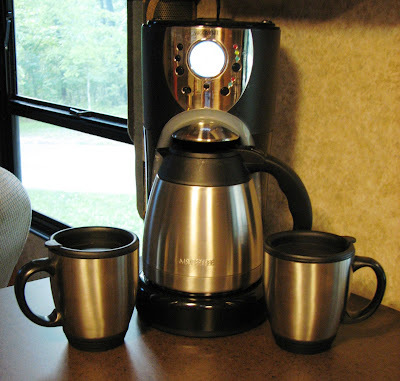 It has a thermal carafe so we can carry it with us outside to keep the coffee warm for us. It even matches the thermal coffee cups we bought a few months ago. The result was two full hours sitting under the awning, watching the rain, reading and having an endless cup of fresh hot coffee by out side. 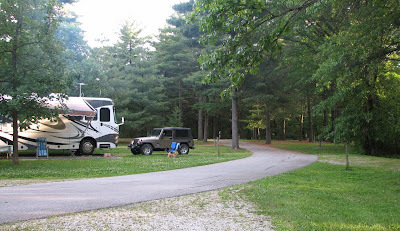 We have found that contrary to most RVers, we do not fill our grey tank first but our black tank. This is apparently a ‘byproduct’ of Ken’s Crohn’s disease. Since he was going to be here four days without sewer hookup he’s been making daytime runs to the pit toilets here. Since they are very close by I decided I’d do my part as well and was amazed at how clean things are here. They really do a good job with this park. It’s hard to imagine it’s nearly empty. I stopped by the showerhouse for a look-see as well, even though, as I said, grey water is not our problem and I WILL use my shower, not their’s. 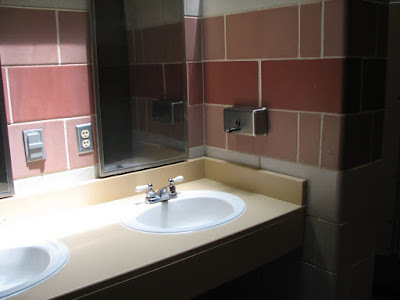 I was pleasantly surprised with the facilities as well, all tiled, clean, dry and bug-free. I guess between the tick scare, the weather and it being the week after a long Memorial Day weekend, there’s just too many reasons people found not to camp this weekend. And, I’m certainly not complaining about having so much of the park all to ourselves. 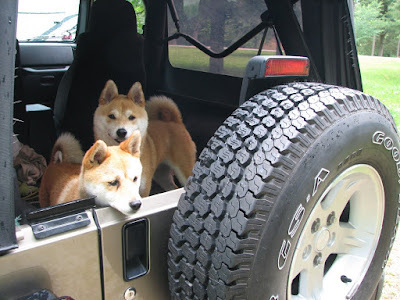 After eating our breakfast close to dinner time, we decided, with threats of continued rain, to load up the dogs and explore a bit of the park by jeep. We went down to the concession area so Ken could check out the fishing license situation. He doesn’t need one with his Illinois P2 Disability card, so now we know we only need to buy one permit for me. 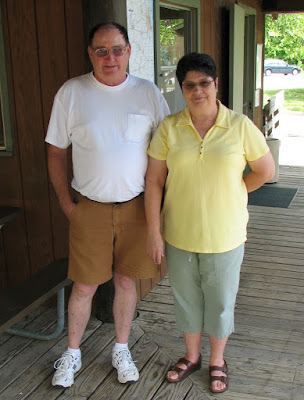 Rich and MaryAnn Martin run the concessions and boat dock staying at the park fulltime in their 5th wheel during the season. They gave us lots of interesting tidbits about the park, including pulling out a bird book to show us some of the unique species that they have been seeing in the area. 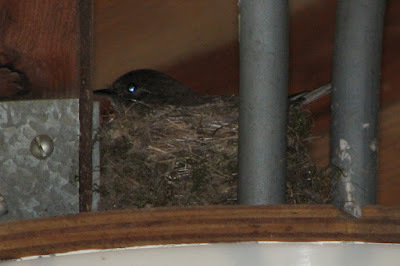 They also took us around back to see were a little Phoebe bird was nesting with her second set of little one’s for the season. 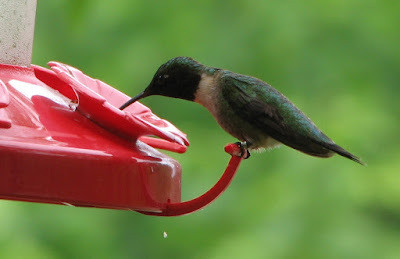 The also have lots of feeders out with dozens of these little critters buzzing the area. I went down and walked the dock area. I had forgotten how clear this spring-fed lake could be along the edges. 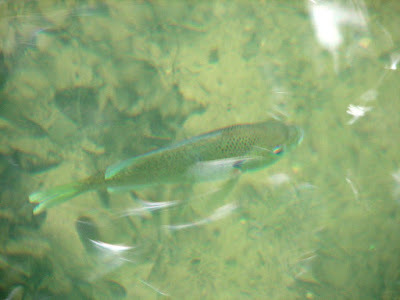 …to even photograph the fish from the surface. With our eating schedule all moved back several hours, we decided at 2pm to head over to Mike’s Place in Liberty. We had decided earlier in the week to make this one of our meals since we’d neither been there in years. As usual we did our best to get lost along by taking unmarked gravel roads and simply using the compass to stay in a general westerly direction. Eventually we arrived, after seeing some really pretty country, and an especially lovely valley with a spring running through it and a beautiful tiny country church. I guess I’m going to have to get braver in taking photographs because this would have been a great place to put a picture of Mike standing next to his Sunday menu board. They have great variety of Sunday dinners with some unusual entries included such a quail and duck. Mike said they already had 25 reservations for Sunday, so this little town café with awesome food is definitely popular. We had Cajun steaks, with mashed potatoes, gravy and huge slices of warm homemade bread. We were too stuffed to finish off with one of their famous desserts. That didn’t stop us from buying a couple of pieces of pie to bring home for a late night snack. They have gooseberry pie which I’ll do next time since rhubarb had my attention this time. We discussed on the way back that we’d be less timid about taking some of these pictures if we had a ‘business’card we could hand out to introduce ourselves that included our website address. This way people might better understand why we are taking the pictures and might even be interested in visiting the website to see themselves if they were agreeable to the photographs. When we got back to the coach, we worked on the card format. We’re not sure this is what we want to use longterm so we’ll get a small number made and try them out. Ken took a nap and I read. Aztec Rage is the fourth in a series Ken and I have read about the ancient Aztec and Mayan civilizations. The series was started by a writer named Gary Jennings who passed away after writing the first 3 books. I understand he died before completing this book which is why there are two additional authors listed on the book. If you like historical novels, especially an interest in ancient civilizations, and have a strong stomach to deal with some of the more graphic details of how nasty humans can be to other humans, this a really interesting series. While we were enjoying our quiet time, Trevor somehow got a call through to us, to let us know that he will be moving to Drew’s house to live next year. That is the house on several acres where we boondocked back in April (see earlier blog ‘Easter and Eastern’). This is a really nice place and will work well for us on our overnight trips to Charleston. Trev wants us to come up in a few weeks to help him move, and of course, there will be a ‘welcome Trevor to the house’ party --- any excuse for partying counts at EIU. About 8:00 with a fire going nicely, Ken decided to cook our late evening meal totally over the open fire. He did chicken breasts, baked potatoes, one sweet one white, and corn on the cob. It was absolutely delicious. As it turns out, we’ve gone the entire weekend without using our propane grill once…very unusual for us. We stayed up late around the fire. I’ve found I prefer these campsites with a firepit under the open sky instead of trees. The stars, and the campfire and the slight breeze warding off the bugs…life is good! We left the windows open instead of turning on the air so we could sleep with all the forest night sounds. It was another great kickback morning on Sunday. As usual, Sox and Trevor had a large fan following developed and some of their little friends came over to say goodbye. 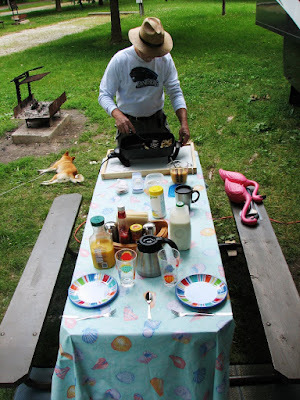 Ken cooked a late breakfast of southwest scrambled eggs and sausage. Afterward, we did some housecleaning to change bed sheets, etc., and then kicked back again to write this blog. It’s far too pretty here today, temperature in the upper 70’s, slight breeze, for us to be in a hurry to pack up. And I think I can finally say it without jinxing the remainder of the weekend….I have not seen a single tick the whole weekend! We took a last jaunt down to the dock and let the dogs play a little at the edge of the water. 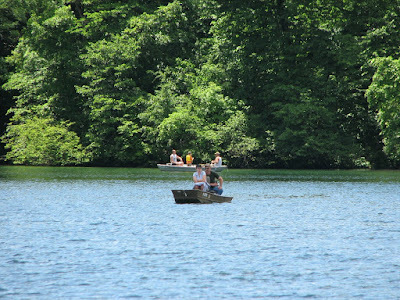 With the weather nicer there were several more boats out on the lake fishing. Of course, Ken suddenly had a hunger for ice cream again and decided to visit Rich and MaryAnn again to eat his dessert before lunch. When we got back to the campsite, two of our neighborhood buddies were waiting for us to show us their catch of the day. They located this interesting looking little monster crawling not far from their camper. We will be back here for sure. Siloam Springs is a real piece of paradise for they way Ken and I like to spend our weekends. We’re hoping next time to bring bikes and to be able to spend some time fishing as well.